Description: A 30 car westbound behind a pair of GEs rolls into the Royal Botanical Gardens approaching Bayview Jct. 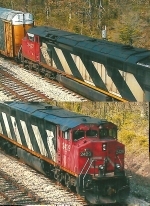 Description: CN train #349 rolls into La Crosse behind three "zebra" CN motors - note the sway back on the second one! Description: Train 394 rounds the connecting track from the Flint to the Holly Sub and is now on its way to Detroit. Description: Train 394 works at Durand on the Flint Sub. When it finishes here, it will take the connection to the Holly Sub to get to Detroit. Description: Nice Lashup CN C40-8F, BN SD60M, EMDX SD60. Description: the one that got away. before this train arrived view was obscured by Eastbound at last light. I'll go out on a limb and claim that signal bridge was installed about the same time this fill was created C1915 for the National Transcontintal Railway. It's a unique structure which no doubt at one time hosted semaphore signals. Description: CSX Q62012 heads south. Description: Also the name of a Metallica song lol. The crew of 397 cut the ligts for me as it hits the connector track so it can get off it's home rails and onto the J's. Description: CN train M31971 (Geismar, LA - Champaign, IL) crosses CCC Rd to take the trestle across the Bonnet Carrie Spillway. Description: CN train M31971 (Geismar, LA - Champaign, IL) on the Bonnet Carrie Spillway. The gates to divert the Mississippi River were open today. Within a week, the water should be near the bottom of the trestle. Description: With class lights lit, CN 2429 storms east.. Description: A Dash 8 CM cools its heals at New Brighton with IC 6030. Description: IC 6030 brings the WC transfer into Northtown Yard with an ACe to be handed off to the BN.